Since qualifying, things have not been particularly rosy for the NUEL as they slid to a 2-0 loss against the very established FM-eSports in their first match. However, there had been some promising signs despite this and with the acquisition of ShavenTortoise replacing mc hal, there was reason to be optimistic. One week in and winless, the NUEL were out with a point to prove. As the teams jumped into the game it became clear that both were looking to make aggressive plays. Skirmishes were erupting all over the Rift as the players looked for small advantages. A nice gank from Dan’s Nunu almost got the better of Dynasty’s Lux, but ShavenTortoise was able to tunnel in on Rek’Sai and ensure no damage was done. 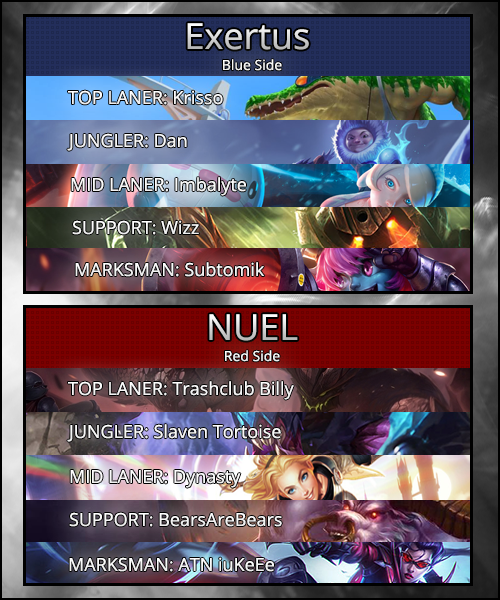 Trades in the bottom lane saw Wizz’s Nautilus using Ignite, though to little effect, while Krisso’s Renekton opened up a small lead for himself against Trashclub Billy’s Malphite in the top lane. Five minutes of activity, but little had been gained by either team. Spectators had to wait till the seventh minute for something of note as the NUEL noticed Nunu on the top side of the map. NUEL took the Dragon, but this was not where the action was unfolding. Renekton was going toe-to-toe with Malphite. A close fight saw Malphite win out and secure the kill on a slither of health. A short time later, some trading in the bottom lane drew the attention of the NUEL jungler and mid lane. However, Lux was spotted walking over a ward. Nautilus attempted to engage onto the vulnerable Lux while both top laners looked to teleport in. An ultimate from Imbalyte’s Orianna managed to slow the momentum of three members of NUEL leaving Malphite stuck between a rock and a hard place as he struggled to fend off three champions. Rek’Sai flashed in to help, but it was in vain as both went down, Wizz’s Nautilus doing a great job of preventing the carries from entering the fight. The newly christened BearsAreBears on his favoured Alistar managed to use ignite to kill Renekton, but fell in the process. It was a three for one trade, a swing in the favour of Exertus as Subtomik’s Tristana picked up two of those kills. The players returned to their lanes, the NUEL still licking their wounds. BearsAreBears saw the need for some deep vision, but was caught out of position. With no Unbreakable Will available, Alistar was a vulnerable target and soon went down to Tristana. The NUEL had to try and shut the yordle down and hatched a cunning plan. The bottom lane baited an engage from Nautilus and Rek’Sai tunneled in from the fog of war. Tristana was able to make it to safety, but iuKeEe’s Vayne was able to pick up the kill. Nunu tried to settle the score, but the crowd control was too much as the NUEL were able to retreat safely. Exertus managed to maintain their 2.2k gold lead courtesy of a tower in the top lane, but NUEL had managed to get something back. With Exertus in a good position, they looked to start the Dragon. While Nautilus found himself in uncharted waters and was brought down trying to gain vision, Exertus were still able to secure the objective, the NUEL unable to contest it. Exertus were feeling confident now and sent three members to secure the bottom turret, but a nice rotation from the NUEL brought four members to the middle lane. Exertus rushed to defend it, but Malphite was able to buy time for the other members to secure the tower. A handy headbutt from Alistar put a stop to the shenanigans and disengaged the fight. All was calm again on Summoner’s Rift. There was a lull in proceedings as both teams waited for the next Dragon to come up. NUEL had managed to exchange turrets in the previous flurry of action, but this seemed to count for nought as Exertus had been able to extend their lead. The biggest differential lay between the AD carries, Vayne sitting on one kill and 116 cs. Meanwhile Tristana was rolling in the riches brought by three kills and 179 cs. It was a similar story for the top laners as although Malphite had been able to hold his own, Renekton had been able to open up a 40 cs lead on the him. The Dragon spawned with a roar, but the NUEL were understandably hesitant to start it, lacking significant vision and somewhat behind in items. Exertus did not seem bothered by the Dragon’s appearance and peeled off to take the middle turret leaving the NUEL to secure the Dragon uncontested. Malphite teleported back up to the top lane to prevent Krisso’s Renekton taking another turret for Exertus, the exchange of objectives ending there. Exertus continued to slowly accumulate a lead, invading the NUEL’s jungle and taking what they could find. Meanwhile, the NUEL seemed content to stay safe and farm up and not give away any objectives. It wasn’t until twenty-four minutes in that the Rift erupted into life. It was the bold invasion of the NUEL’s jungle that proved the turning point as Exertus were caught slightly out of position. As they made a hasty retreat, Nautilus was caught by Rek’Sai and went down to Lux. A Shockwave from Imbalyte was only able to catch the support, but Tristana continued to rain damage onto the members of NUEL. A long drawn out fight led to the Malphite and Nunu fleeing to safety. Meanwhile Vayne was dropped by Tristana and Alistar soon followed, but bold positioning cost the Exertus AD carry as a binding brought the hard-hitting yordle down. Some greedy play from Orianna bought enough time for Lux’s ultimate to come back up, the now respawned Rek’Sai able to call time on the Lady of Clockwork. It was a useful four for three trade for the NUEL, though with no objectives gained. However, with Vayne caught in the open by Renekton a short while later, any advantage gained was smothered. With only four men on the field for the NUEL, Exertus felt safe to push their advantage. While they were able to take down the turret in the top lane, Renekton was caught while attempting to flank and was quickly burst down. A Lux laser helped keep the rest of Exertus at bay as they pushed for more kills. The entire team was low and with their front line pretty much non-existent, Exertus made a hasty retreat. Both teams had time to wait for their players to respawn and headed for the Dragon. While the NUEL managed to secure position for the Dragon, they had very little vision compared to that of Exertus. A teleport from Renekton caused panic in the NUEL lines as they backed off the Dragon. However, a huge counter-engage from Malphite and a Lux combo quickly turned what could have been a devastating fight. Both top laners were isolated and went down, but Exertus had also lost their support. Their health bars were low and thus were forced to flee. The NUEL secured their third Dragon. Things were starting to look better for the NUEL as Exertus sent Renekton to split push in the bottom lane. A quick skirmish between Renekton and Malphite sent the Shard of the Monolith back to base. However, this was not the main focus for Exertus as they had just started Baron. The strength of Tristana and Nunu’s Consume-Smite combo meant that they made easy work of it, but not before a teleport from Billy and an engage from the marauding Alistar came in. The cow was quickly put down by Tristana after she finished off a vulnerable Vayne while the Yeti Rider chased onto Rek’Sai with a helpful last hit from the Krugs. Malphite was able to shut down Tristana and nearly succeeded in killing Orianna, but the intervention of the rest of her team prevented the loss of their second carry. Meanwhile, the Baron buff had done wonders for Krisso’s Renekton as he had been left alone in the bottom lane, taking an inhibitor tower in the process. Exertus had made huge gains, the NUEL not quite reacting quick enough. If that fight could be described as messy, the one that followed would not have looked out of place on the TV show “Obsessive Compulsive Cleaners”. They say “One sheet does plenty” but you would have needed at least ten to clean up the Rift as both teams struggled to clear out the other. Vayne jumped onto Renekton but got more than was bargained for, securing the kill but being forced to scurry away on very little health. However, Nautilus was able to land the killing blow with Depth-Charge. A beautiful binding from Dynasty’s Lux with her combo to follow up burnt Tristana to a crisp while Alistar and Malphite soaked up damage on the front line. Alistar took a little too much punishment and was killed by Orianna, but Rek’Sai was re-entering the fight. Able to knock up Nautilus, the Titan of the Depths struggled to stay afloat, Lux also securing that kill. Dan’s Nunu was picked off and the NUEL’s members chased after Orianna. However, this was perhaps not a great use of resources as, with Dragon up, there were objectives to be taken. Despite the extended chase they tried to start the Dragon only to be forced off by the now respawned Renekton. The Dragon went to Exertus, but things weren’t done there. Nautilus managed to land a dredge-line onto Lux, but she was backed up by the rest of the NUEL. The Exertus jungler and support again died for their sins. Subtomik’s Tristana did not survive much longer as Renekton and Orianna made a hasty retreat. Another two towers went down to the NUEL and they were back in the game. With Baron spawning in forty seconds, the game was heading towards an explosive finish. Both teams could feel the tension as they assembled around Baron. With both top laners in the bottom lane, it looked to be a straight four versus four if a fight broke out. It was Malphite who first made the move up to the top side to pressure Baron, sacrificing the inhibitor in the process. While the NUEL secured a kill onto Nunu they could find little else. Malphite was able to return and save one nexus turret, but the other went down. Orianna was low and forced to back meaning the NUEL felt it was time to take Baron. However, Renekton’s teleport had just come off cooldown. Nautilus bought time for Tristana and Renekton to enter the fight before dying, allowing them to clean up the rest of the NUEL lineup. Vayne went down quickly followed by Rek’Sai. A dallying Lux was jumped on soon after while Malphite was taken down by Renekton. An ace around the Baron pit for Exertus and that was the game as they headed for the nexus. A very messy and close game from both teams, but it was the blue side that came out victorious. While the first game was reasonably even, this was more one-sided. While the NUEL started brightly, by twenty minutes they had faded away. Both teams started off quite safely with lanes not looking to trade excessively. The casters had to wait till the eight minute mark to get excited as the teams clashed over the first Dragon of the game. The NUEL had decided to start it resulting in ShavenTortoise’s Elise being incredibly low as the fight began. A teleport from Krisso’s Maokai brought chaos as Dan’s Evelynn snuck in for the smite steal. The NUEL were able to pick up a two for one courtesy of a nice flank from Dynasty but it was a blow to the ego. With summoner spells burnt, everyone returned to their lanes much more vulnerable. Exertus looked to exploit this straight away by sending Evelynn to the top lane for a lane gank. While this was not successful, Elise headed straight for the top lane to attempt a cheeky gank of her own. However, the Spider Queen did not realise that the invisible Dan was lying in wait, Maokai and Evelynn jumping on the exposed Elise. Malphite tried to help out by using Unstoppable Force, but it was not enough as both went down to Exertus. While Imbalyte’s Orianna had roamed up to the top lane for moral support, Dynasty’s Lissandra was after more as she clawed her way towards the already low Evelynn and got some revenge for her team. Maokai escaped, but it was a two for one in the favour of Exertus. The bottom of the map had seen very little action since the fight over Dragon. Yet this was all about to change as Exertus again used Evelynn’s invisibility to good effect. iuKeEe’s Kalista found herself cornered between Thresh and Evelynn, but despite Kalista’s best efforts, a Thresh hook extinguished any hope of escape, Evelynn’s early pressure netting her a kill. This was the signal to start Dragon for Exertus as they comfortably took it. Kalista slowly made her way back to lane, but little did he know that there was an ambush lying in wait. Having used his Flash in the previous fight, he was a very easy target as Evelynn and Thresh sprung their metaphorical trap card. Kalista was quickly brought down by a combination of the two. Malphite tried to teleport but had it cancelled by Krisso’s Maokai. The NUEL jungler and mid laner were quick to respond though, able to clean up the now very exposed members of Exertus in the bottom lane. A nice three for one exchange meant things were looking bright for NUEL’s finest. However, it all went downhill from there. A Homeguard-Teleport play to the bottom side of the map meant that the NUEL’s botlane fell to Exertus along with their tower. A few minutes later Elise was caught out in the Exertus jungle leading to yet another tower lost. Some poor decision making meant the NUEL took a fight while outnumbered in their own jungle. A three-man Shockwave later and NUEL were even further on the back foot, four more kills going over to Exertus as well as a turret. The 8.3k gold lead spoke volumes. A quick pick onto Evelynn gave the NUEL some hope, but Lissandra was in turn taken down soon after. The rest of the team rushed to protect him, but this only resulted in Malphite falling as well. A teamfight later around the NUEL’s bottom turret again went badly as they could not quite focus down Tristana. The Exertus front line ran riot leaving only Shen standing. Exertus took a quick Baron and retreated to begin the siege all over again. Things were past the point of no return as events were beautifully summed up by Maokai taking a one versus three fight with Malphite, Shen and Elise and somehow winning, forcing the three to flee. As the tree took down Alistar, the rest of his team came to clean up the fight, bringing down Malphite too. One more fight later and Exertus had the game. Despite the NUEL’s early promise, it wasn’t to be as Exertus closed out the game cleanly. Well, it’s early days for the NUEL and while they do remain winless they have only played two matches out of fourteen. While there admittedly have been causes for concern, the team looks to be improving. Tune in here on Saturday 19th September to watch the NUEL’s next match against Team Infused.